I really enjoyed The Bone Season. I put off reading the book for so long, because of all the hype surrounding the novel. It's immensely popular in the UK, as well as in the United States. But when I finally read it, I loved it! I was intrigued by the intricate and complicated world - I hadn't read too many novels like The Bone Season. Nevertheless, I think this sequel did the first book justice, and I'll definitely be impatiently waiting for book three. In this novel, Paige has escaped the penal colony, and returned to SciLo, to the syndicate, to her mime-Lord, Jaxon. He doesn't want her to spread word of the Rephaim's existence, but she wants the syndicate to know. Certain events are set in motion - the syndicate Underlord is murdered, and a new Underlord (or Underqueen) must take his place. Meanwhile, EVERYONE is looking for Paige - or The Pale Dreamer - or the human that consorted with a Rephaim. The streets are more and more dangerous for her, but she will stop at nothing to bring justice to the clairvoyants who were taken, and to warn the syndicate of the existence of the Rephain - with or without the Rephaim (in particular, Arcturus, who has yet to be found). This book definitely gets off to a slow start. The sampler that was available on NetGalley featured about 20% of the book, which is a solid chunk! I had read the sampler a few months ago, and wasn't all that satisfied or impressed. However, after certain events occurred, I was hooked. Once the Rephain came back into the picture (and I'm talking about Rephaim that aren't Arcturus, actually), things started to pick up. There was all kinds of high stakes and sneaking around and straight-up MESS, in this book. Paige was constantly going behind Jaxon's back, meeting with other Sheol I fugitives, or meeting with the Rephaim, or doing things that she didn't want Jaxon - or anyone - to know about. My heart was literally pounding every time she went sneaking about - Jaxon really didn't seem like a person to piss off. I mean, the state of affairs with the Rephaim is pretty important, but Paige needed Jaxon's protection. Which she quickly finds out. As with book one, the world-building in this book is intricate and impeccable. This book takes place completely in London, but you really get a feel for the futuristic city. Mention of the Americas is in this book, which I thought was nice - it put the setting of this book into perspective. There is very little of the Rephaim in this book, yet their presence is always known, like an undercurrent. Nashira isn't present in this book, and several key Rephaim do not appear until about midway through the book. As for Arcturus... don't worry, he's in this book. Check out my blog on Thursday (December 18th), if you want to see a fun scene between Arcturus and Paige. Okay, so, the romance. Honestly, I'm a huge fan of the romance. Arcturus (a.k.a. Warden, so no one gets confused) doesn't appear until more than halfway through the book. And even then, Paige and Warden kind of put a wall between themselves, because Warden is marked by the Rephaim, now that Nashira told everyone that he was "consorting with a human". BUT. The chemistry/physical/emotional connection between Paige and Arcturus is so obvious and burning and THERE, so, don't you worry about the romance. I love the progression of the romance, even if it feels like it isn't there. I like Paige. She's very tough, and not just physically. She makes some incredibly difficult decisions, like going behind Jaxon's back, about many things. Honestly, I'd probably be very docile and most likely hiding, if I had a choice. But she totally stands up to the Sargas family, to SciLo, to the syndicate. I'm quite pleased with this sequel. It was slow, but much happened in this book. A LOT happened, really, in small chunks, spread over a long book. The ending is kind of a slap in the face. No, a punch in the face. Holy guacamole. Book three book three book three! Like I've been saying, this book starts off very slowly. I'd say the first thirty ish percent is pretty sluggish, though I can understand why. Shannon is setting the scene and tone for the rest of the book. But the book is really long to begin with, so it felt like things dragged. I feel like this will definitely be a deterrent to some, or possibly a reason for some to DNF, so I thought I'd mention it. Well, if you read book one, there is no reason for you not to read book two! I liked this sequel a lot, and I would highly recommend reading the sequel. And, if you haven't read The Bone Season, and you're interested, then I think you should get it a try! Just be warned, the books are loooonngggg (they're adult novels, not YA). So, tuck in! 4 stars. This book didn't end in a such a way that I felt anxious (like The Bone Season did), but some crazy truths were revealed at the end of the book, so I definitely want to keep reading. Book three, please! YAY! Another 4 stars for this one! So happy to hear you liked it! These books as the Red Rising ones are clearly more adult oriented given the length and also the certain slowness of the build up in them, but I definitely love them and love how fascinating the world building and the politics and scheming in them! Yep, they're actually tagged as Adult (you can tell by the prices). I'm liking both series, so no big deal! 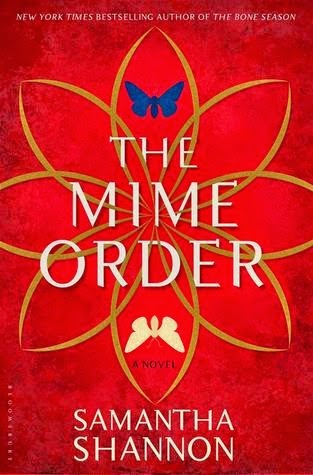 I'm so glad that Arcturus is in the story and that the romance is there :) I loved The Bone Season and will definitely be reading The Mime Order. Great review! YES!! Me too! This one is definitely worth reading. Thank you!! You definitely should!! Hope you love the books if/when you read them. It's okay though! It's totally worth the wait! And you definitely should give the books a second shot - maybe after all of them are released. You're very welcome! Thank you very much, Liza!